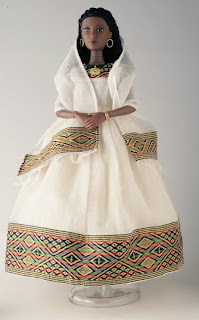 I bought this doll a year or so ago as a collectors item for my daughter( the one on the way) It's beautifully made and is a regal image of the history of Ethiopia. From what I remember, the clothing was actually made in the country. The doll is so detailed...even showing the tattooing around her neck that was common in that region and time. Mine came with a book and CD. Now you can special order her crown. I'll be calling to get that soon, what's royalty with out a crown right. www.ethiodolls.com for those of you who are interested in collecting this doll. It was only fitting for me because I have a doll that represents Jamaica (my husbands Mother) complete with knitted Kufi hat, braids, beads and all. I also have a doll that represents Trinidad (my parents homeland) outfitted with a beautiful black red and gold sari. Adorned with henna tattooing on her hands and all. The Queen Makeda Doll is a welcome addition to the bunch. I'm proud of my heritage and I want to fuse my daughters rich heritage with my own. It's interesting that some of the Ethiopian culture resembles my own. For example: Injera (bread) has a similar concept to Roti (bread) We stuff roti with yummy stuff like curry chicken and potatoes and they use injera to pick up the food and eat it, using no utensils...just fingers, like us. And the most treasured finding so far is that I found out my mother's name, great grandmother's name and several other females in my family are named "Keren". I've never met anyone other than my family members with the name "Keren". Well one day CHI announced that they were cleared to facilitate humanitarian work out of Tigray a northern region in Ethiopia. So I decided to do some research on the northern regions and to my surprise there is an area called "Keren"! Come to find out Keren is not so uncommon of a name in Ethiopia. What a connection! What an Honor! Who knows what else God will lead me to learn about myself and my precious Jewel. Thanks for commenting on my blog. I love your doll. I was enamored by it as well, but haven't purchased it. It's beautiful. It's quite interesting that Ethiopian and Jamaican culture share many similarities isn't it? I can't wait to follow your journey with CHI as well. WHAT'S TAKING SO LONG ? The Number Nine Is Fine!